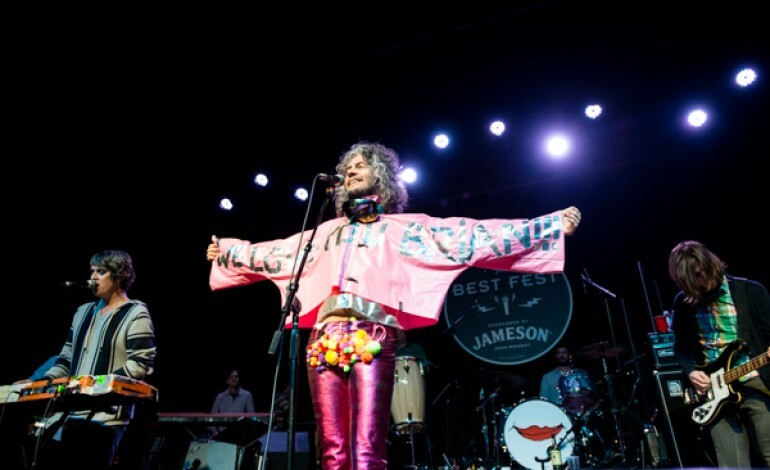 Oklahoma native and psychedelic alternative rock band The Flaming Lips have been steadily debuting brand new unheard music all throughout October at a yoga studio in OKC during classes. Now it appears that, according to Consequence of Sound, it has breached the confines of the The Yoga Box wall and the news of a new album has finally been announced. Oczy Mlody will be released on January 13th, via Warner Bros Records, and the lead single “The Castle” is expected to be released later tonight. The LP follows the band’s last album, With a Little Help From My Fwends, released 2014 and was a tribute to the Beatles, and featured the first full-length original from the group since 2013 with “The Terror”. Oczy Mlody features 12 new mind bending tracks, with titles such as “Galaxy I Sink”, “There Should Be Unicorns”, and “Listening to the Frogs with Demon Eyes”, and of course the title track “Oczy Mlody” that kicks off the upcoming LP. A preview to the lead single “The Castle”, which should arrive tonight, was tweeted earlier this morning, giving a sneak peak as to what the album may hold. The segment is a slow paced, relaxing track, with enjoyable vocals and as to be expected psychedelic undertones. Oczy Mlody has been teased by the band in the last few weeks, but whether on Instagram (with picutres tagged #oczymlody), or on their other social platforms, the LP will be a refreshing look into what the band has been up to these last couple of years, and perhaps the new work will be followed by a highly desired tour.